Body Drench Charcoal Purifying Facial Sheet Mask, Single Use Packet, .85 fl. oz. Removes toxins, nourishes skin and cleans clogged pores. 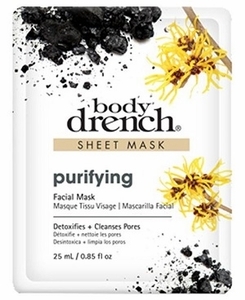 This luxurious mask is infused with several key ingredients including charcoal, sea salt extract and witch hazel extract.